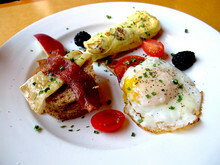 Brunch is not a meal to be taken lightly among the foodies of San Francisco. In fact, San Franciscans are notorious for waiting hours in line for the best brunch in the city. But with so many restaurants in this seven-mile grid, surely Brenda's, Dottie's and Zazie's aren't the only wow-factor brunch spots. Fear not, for there are indeed places with little-to-no wait and incredible food to nurse even the worst hangover. After a little investigating, and with apologies to the neighborhood regulars, we're outing the best-kept-secret brunch spots in San Francisco. After much demand, Stable Cafe decided to set aside its one day off and bring brunch to this east Mission neighborhood. During the week, Stable is a typical coffee shop with people browsing the Internet, stopping in for low-key lunches or snacking between classes at ODC Dance Commons. On Sundays, however, Stable prepares its weekly brunch of family Italian recipes alongside modern Brazilian and Mediterranean fairs. Thomas Lackey, who runs Stable with his partner, wanted to expose people to simple foods from his favorite countries, and grows most of the raw ingredients at his farm in Petaluma. Try the yogurt parfait with homemade granola, and then move onto the Nono, a thin toasted baguette with seared tomato, provolone and a fried egg. Top it all off with a refreshing melon horchata and thick, chewy mint chocolate cookies. Tucked away on a quiet residential street in Pacific Heights, the Red Door Cafe is a tiny, but lively restaurant. The kitschy-goth interior makes for great conversation while you're waiting to snag a seat at one of the six table. The friendly owner, Ahmed, takes turns playing hostess, waiter, and barista while three cooks make magic happen in the background. The Red Door's menu features a delightful cultivation of French and Latin cuisines, fused together with modern originality. 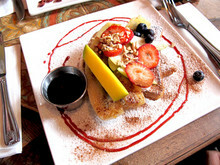 The daily specials are tempting, but the signature French Toast is not to be missed. While it's not the best group dining spot, this is definitely the place to take your favorite brunch snob. What could be better than having an amazing brunch at the very place that gave you your hangover? Ta-Wei Lin brings his “cultural liberation brunch” to the Doc's Clock as a alternative brunch in the Mission. This pop-up restaurant promotes a new menu every week, but always features a version of Vietnamese crepes and papaya salad. The perfectly crispy, crunchy crepes, which can be made vegan, are filled with saucy meats, veggies and fresh bean sprouts. Lin and his co-cook, Vivianne (a line cook at Bix), source their groceries from neighborhood markets, and start prepping at 8am every Sunday. At $8 a plate, bring your friends and order one of everything. Wash it down with the Doc's Clock Sweet Tea Lemonade for the perfect summer afternoon. Oh, and Lin encourages going green — if you'd like to place a to-go order or take home leftovers, he asks that you, please, bring your own doggie bag. What started out as five years ago as a traditional El Salvadorian restaurant, the Sun Rise Restaurant (not to be confused with Sunrise Cafe) now houses some of the best vegan dishes in town. The bright space oozes with changing local art to match the colorful food of this family-run restaurant. And while the meat is tender and tasty, the vegan dishes are a hit with vegans and carnivores alike. The evolution came from a growing demand for vegan food, and Sun Rise was happy to accommodate. Try the Vegan Chorizo (scramble or burrito) or the can't-believe-it's Vegan French Toast, with a glass of the refreshing passion fruit juice. With large portions, friendly service, and a little something for everyone, it doesn't get much better than brunch at Sun Rise. Following its much-anticipated opening four months ago, Passion Cafe is now operating in full capacity and serving up one of the best French brunches in the city. The vast space took 3 years to complete and is furnished with a blend of recycled and antique décor. 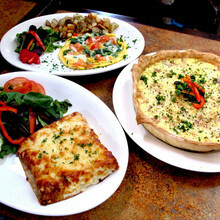 Co-owner Jacques Andre, who formerly ran a restaurant in Paris, jokes that this eatery, like its tasty quiche, is made from scratch, and with passion. The menu and pastry case transport you to France while the cozy rooftop seating provides an oasis in downtown San Francisco. Try the decadent croque monsieur and hot apple soup — a unique treat. Save room for the melt-in-your-mouth white chocolate mango bread pudding from new pastry chef Suzanne Navarro (formerly of the The Slanted Door and Waterbar). The menu boasts so many French delights, but don't get overwhelmed, you can always come back for more. Imagine Max from Where The Wild Things Are, all grown up, running a restaurant by the beach. This is exactly the feeling you get when walking into Outerlands. There's literally a tree-house loft in the delightful interior of the restaurant! And then there's the rustically charming David Muller, busily running around, manning the fort. Muller and his wife, Lana Porcello, have put a lot of heart into their thriving neighborhood restaurant, which evolved from dinner parties they hosted for friends. The wide shutter-style windows open up during Sunday brunch at Outerlands, and the inviting smell of bacon wafts out onto the street. Kick back and get cozy with a delicious mug of their hand-ground coffee (served in large carafes). Then choose from the crave-worthy menu that encourages tasting and sharing. Their Dutch pancakes alone — sweet or savory goodness baked to perfection in a cast iron pan — make Outerlands well worth the trip.